On Tuesday, October 3 a jury convicted Michael Coscia of six counts of commodities fraud and six counts of “spoofing” commodities markets. This ruling has sweeping ramifications for market participants, including traders and hedgers. Mr. Coscia, of Panther Energy Trading, was accused of entering large orders of futures that he did not intend to execute, in order to lure other market participants into the market and profit on smaller, often opposite, transactions. This activity occurred in 2011. Spoofing is illegal since the Dodd-Frank Act went into effect and was regulated as market abuse in some markets long before Dodd-Frank legislation. This is the first criminal prosecution related to spoofing the markets. It comes with the potential of $1MM in fines and 10 years in jail for each incident. Sentencing will occur in 2016. Mr. Coscia’s defense included statements that he intended to execute each and every order placed and only cancelled these orders when the risk profile of the transaction changed. The defense also claimed that no one was harmed if found fraudulent. They contested that other market participants, such as hedge funds, are sophisticated and understand market risks. Rebuttal included that less sophisticated investors and commercial hedgers can also be caught in the wake of this type of trading activity. It is largely believed the act of entering and cancelling transactions is a common trading practice to facilitate price discovery and gauge market liquidity. There is a fine line to be monitored. This verdict sets new and narrower precedent and definition of spoofing. It demonstrates what lines of defense Regulators and Department of Justice will deem inadequate. Appeal is yet to occur. Common belief in compliance circles is that the ruling may ignite regulators to enact on more assertive pursuit. It also may curtail trading activity and impact liquidity and market prices. The CME and ICE have market surveillance in place to identify possible spoofing violations and have investigated, warned and in few occasions sanctioned market participants. All market participants, including commercial hedgers, will need to systematically self-monitor any transaction activity that can be perceived as spoofing. Though this case was framed by the media as an activity associated with High Frequency and Algorithmic Trading, not honoring bids and offers has long been a violation of open-outcry trading. In fact, the London trader who is accused of spoofing that may have contributed to the flash crash of 2011 was using manual order entries. Regulations against spoofing are also not limited to futures markets. Rules exist in physical commodity, bonds, currency and equity markets. Some organizations are taking action to protect itself from potential regulatory violation. They are strengthening oversight with new compliance policies, training programs, mapping rules and regulations to transaction lifecycle activities and implementing algorithms to detect potential market manipulation violations to self-police, document and discipline. Unfortunately, many others are still latently being reactive to regulators data requests and investigations; exposing their organizations to high investigation costs and potentially large fines and loss of trading privileges. U.S. v. Coscia, 14-cr-00551, U.S. District Court, Northern District of Illinois. Appeal – U.S. v. Coscia, 14-cr-00551, U.S. District Court, Northern District of Illinois. For help improving your organization’s approach to regulatory compliance, contact me at info@pivotalriskadvisors.com. Please share your insights and questions. And, if you like what you have read please “like” this blog, follow me and share with your colleagues and social media. Sid Jacobson works with organizations to improve their risk management and compliance capabilities. With over 25 years of experience driving change and growth for companies engaged in energy and derivatives markets, Sid is known for strategic visioning complemented with a successful track record implementing improved commodity strategies, commercial operations, risk management and regulatory compliance. Most recently, Sid has helped companies improve their compliance policies and governance structures, transaction lifecycle processes and implement trade surveillance algorithms and case management tools. Sid is the founder of Pivotal Risk Advisors. Commercial entities, as well as, financial institutions will be impacted by new margin requirements for uncleared swaps. Most will fare better than expected. There are some facts organizations that transact in Swaps should know. The FDIC and the Office of the Comptroller of Currency approved final margin requirements for uncleared swaps on Thursday October 22nd. Uncleared Swaps are bilateral Swap transactions between two counterparties that are not margined through third-party central clearing houses, such as the ICE or CME. Rules are proposed to be phased-in over four years beginning September 2016, as per a prioritization calendar. There will be no retroactive requirements. The final rule establishes the minimum amount of initial and variation margin that the covered swap entity must exchange with counterparties. Approximately 30% more collateral will be required for uncleared swap transactions, than cleared swaps. Final rules ease inter-affiliate margining requirements. 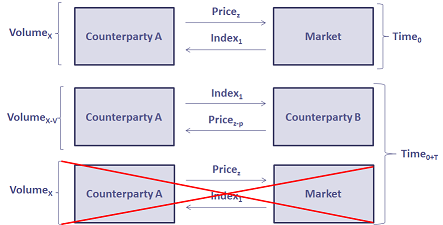 They require a “covered swaps entity” to collect margin from the affiliate at the outset of a transaction. Both entities were required to post collateral in previous drafts. Commercial entities, and small banks, will be exempt from clearing when transacting swaps to hedge commercial activity. Exemption does not mean financial institutions will not require collateral. Banks still need to manage their counterparty credit exposures. A broader list of acceptable collateral is proposed in the final rules than in earlier drafts. The SEC and CFTC still need to finalize their rules. These rules may be different than FDIC rules. They were consulted on FDIC rules. The 2010 Dodd-Frank Act requires that all swap transactions are cleared through a central clearing house to reduce systematic risks stemming from default. In theory, clearinghouses provide financial assurance by collecting standardized collateral from all cleared transactions. Many transactions are still contracted bilaterally between two counterparties and some are too complex for common clearing. 75% of Treasury Swaps and between 40-60% of other asset classes are currently cleared. To encourage clearing and ensure capital adequacy, regulators are required by the Dodd-Frank Act to create collateralization rules for uncleared swaps. Rules for margining uncleared swaps have been under debate for some time due to the many issues such as complexity of transactions, intercompany transactions, regulatory jurisdiction by multiple regulators and global regulatory harmonization. This final rule is good progress, even if not the best answer. Given the SEC and CFTC are yet to finalize rules, FDIC rules should act as a template, but not a final for commercial end-users of derivatives. Data retention and reporting rules are still essential. For more information see FDIC Press Release and Links. Please share your thoughts in the comments section. And, if you like what you have read please “like” this blog, follow me and share with your colleagues and through social media.